MFM FC coach Fidelis Ilechukwu says his players are yet to shake off the long mid-season break following their 0-0 home draw against Akwa United on matchday 20 of the Nigeria Professional Football League on Sunday. 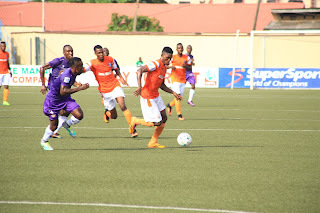 MFM failed to claim their 10th straight home win this after their disappointing home draw against an impressive Akwa United tea. Star striker, Stephen Odey, even missed a first half penalty after a handball by an Akwa United player inside the box. Reacting to the outcome of the game, Ilechukwu stated that his team's profligacy in front of goal was also a factor that caused them the three points but expressed confidence that they will bounce back. "I think the players are a little bit heavy but it's all about work," Ikechukwu told Completesportsnigeria.com. "I am not disappointed (with the result), I believe in the team. We had a lot of opportunities which we could have converted in the first half but we did not."